The set consists of one jug with lid and two tumblers with matching lids. 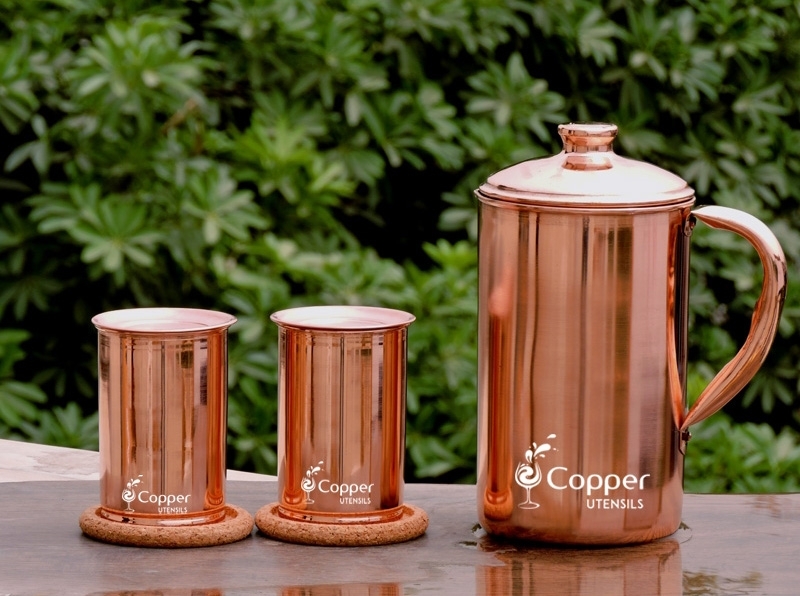 A great way to add copper treated water in your daily life. Copper is a natural anti-oxidant. It helps to strengthen the immune system which leads to faster healing of wounds and cuts. Water stored in a copper jug stays cold for extended hours and the natural anti-bacterial properties of copper destroy any germs or bacteria present in the water. Also, when compared to plastic or steel utensils, water stored in copper utensils stays fresh for longer. 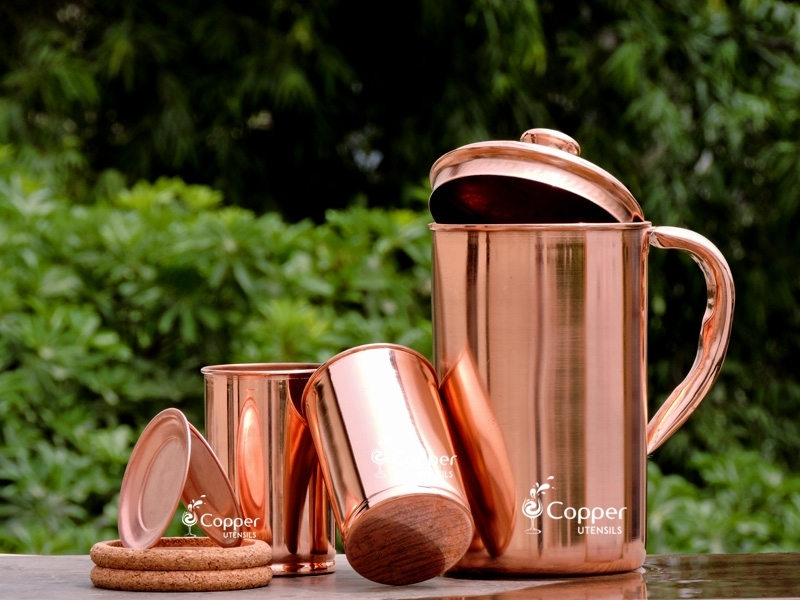 This unique set of hammered copper jug and tumblers is specially made for reaping the benefits of copper charged water. The hammering makes the copper pure and also increases the surface area which means more copper is in contact with the water. One common problem faced while using a copper vessel is the discoloration. The way to counter that is to wash your copper utensil with lemon and salt or tamarind regularly. To avoid scratches from normal washing materials, use an old cotton cloth instead. Also, wiping it dry after cleaning will help to maintain the shine. The size of the pitcher and cups were perfect for me. The copper is shiny and clear of any imperfections. The set came with coasters and lids for each cup which I thought was a plus. It took very long to get the product delivered. But other than that I love my new copper Water Jug and matching copper glasses!!! They are just what I wanted. I bought two of the copper jug set for both of my bosses and they love it. Will be buying more in the future thanks. 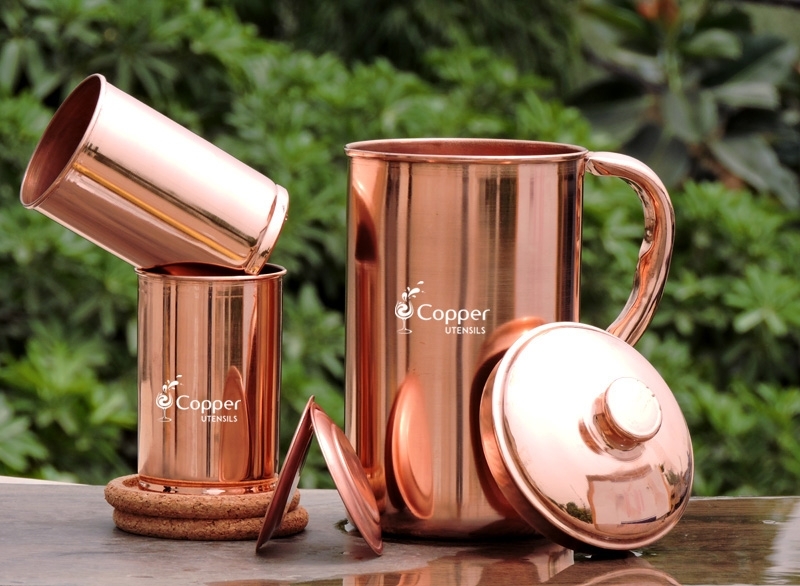 I absolutely love this copper jug set. I bought this one for a friend after I bought one for myself. 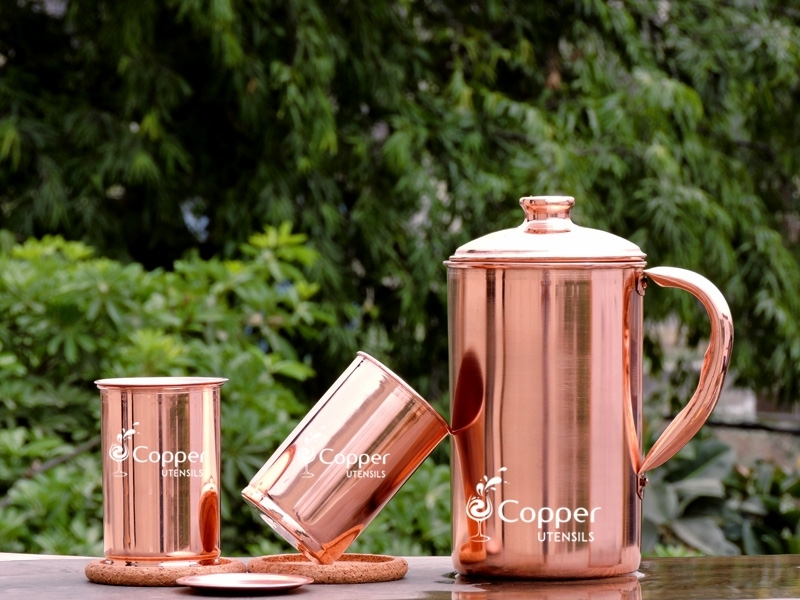 The jug and tumbler are of good quality copper. This was a very pleasant surprise. Heavy and beautiful, I believe this set will last a long time. Shipping was shorter than expected as well. I am very pleased with this purchase and the company. Gave it to the friend as a gift for a housewarming ceremony. They loved it. Best gift to give on traditional ceremonies.